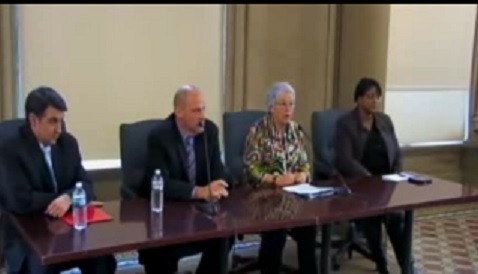 I say Carmen is giving her usual "I love you" speech to teachers as part of her silent deal with Mike Mulgrew to get rid of tenure and to keep his hands off of the terrible, harmful 3020-a process she, Carmen Farina, has set up (watch the video). Her "I love..." speeches are Humbug, political nonsense, rubbish. I've been watching and researching the so-called "termination" hearings for 14 years, and I also watched Carmen when she was principal of PS 6, where my youngest daughter attended. Carmen had no respect for teachers, and picked her army (favorites) to help her attack, belittle or embarrass any staff member who dared to get in her way. She did away with the Gifted and Talented program, because she believed that all students should have the same education at a nice and comfy Level 2 or Level 3, not Levels 1 or 4. I reported her for violating the NYC Department of Education rules for School Leadership Teams, then for not telling us parents where the money was from the Annenberg Arts grant. I and other parents were not afraid to speak up. Carmen was removed as principal of PS 6 in February 2001. Dont be dulled into complacency. 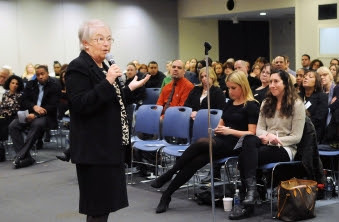 Schools Chancellor Carmen Fariña assured UFT members at a town hall meeting at union headquarters that her first priority — and the accomplishment by which she most wants to be judged — is restoring dignity and respect to the teaching profession. “No one works well if beaten down,” she said at the first in a series of five town halls with educators from each borough. “The best-kept secret is the great work teachers do,” she said. Fariña introduced herself and outlined her long career as a teacher, administrator and Department of Education executive with some amusing anecdotes. She described a “traveling sideshow” when, during her 22 years as a teacher, she was sent on Fridays to other schools to model lessons. “At heart, I am still a teacher,” she said. Fariña explained that she has been emphasizing collaboration and sharing in her meetings with principals, superintendents and network leaders. She also pointed to eight schools, all with high numbers of high-need students, which will serve as demonstration sites featuring best practices. She said she hopes to increase the number to 45 by September. Asked by PS 110 Chapter Leader Ellen Gentilviso to share her vision for gifted and talented programs, Fariña said that she was bringing back the DOE official who was originally in charge of the program after several years when no one was at the helm. “Gifted and talented is a label and is only as good as the teaching and practices in each school,” she said. Fariña said she would encourage the principals of gifted and talented programs to come together to share best practices, with an eye to the best ideas being picked up by all schools. When several members asked her about high-stakes tests and the damage they were inflicting on schools, Fariña acknowledged that it was problem that she was working on. Deborah Williams spoke of the lack of dignity and abuse she feels as a UFT member in the Absent Teacher Reserve pool and asked Fariña when excessed teachers would be returning to the classroom. Fariña said that she was continuing her predecessor’s policy of no forced placements, but, she said, for the first time, the DOE was arranging interviews for ATRs for vacant positions. At the end of the short exchange, the chancellor asked other teachers to write their questions on index cards, and she promised to answer every one.